Save even more by joining our additional Clubs! See store for details. Blue Buffalo Dry Cat Food 3lb, 7lb, & 15 bags- Buy 10 Bags, Get 1 FREE Bag. Blue Buffalo Dry Dog Food 6lb, 15lb, & 30lb bags- Buy 10 Bags, Get 1 FREE Bag. Blue Buffalo Basics Dry Dog Food 11lb & 22lb bags- Buy 10 Bags, Get 1 FREE Bag. Blue Buffalo Freedom Dry Dog Food 11lb & 24lb bags- Buy 10 Bags, Get 1 FREE Bag. Blue Buffalo Wilderness Dry Dog Food 4lb, 11lb, & 22lb- Buy 10 Bags, Get 1 FREE Bag. Blue Buffalo 12.5oz Canned Dog Food- Buy 120 Cans, Get 12 Cans FREE. Blue Buffalo 5.5oz Canned Dog Food- Buy 240 Cans, Get 24 Cans FREE. Blue Buffalo 5.5oz Canned Cat Food- Buy 240 Cans, Get 24 Cans FREE. Blue Buffalo 3oz Canned Cat Food- Buy 240 Cans, Get 24 Cans Free. Health Extension Dog Food 4lb, 10lb, 15lb, 23.5lb, 30lb - 40lb bags- Buy 12 Bags, Get 1 FREE Bag. Health Extension Cat Food 4lb & 15lb bags- Buy 12 Bags, Get 1 FREE Bag. Holistic Select Dog Food 6lb, 15lb, & 30lb bags- Buy 12 Bags, Get 1 FREE Bag. Holistic Select Cat Food 12lb bag- Buy 12 Bags, Get 1 FREE Bag. Triumph Dog Food 3lb & 25lb bags- Buy 12 Bags, Get 1 FREE Bag. Triumph Cat Food 3lb & 7lb bags- Buy 12 Bags, Get 1 FREE Bag. Zignature Dog Food 4lb, 13.5lb, & 27lb bags- Buy 12 Bags, Get 1 FREE Bag. Earthborn Dog Food 14lb & 28lb bags- Buy 12 Bags, Get 1 FREE Bag. Earthborn Cat Food 6lb & 14lb bags- Buy 12 Bags, Get 1 FREE Bag. Natural Balance Dog Food 4.5lb, 13lb, & 26lb - 28lb bags- Buy 12 Bags, Get 1 FREE Bag. Natural Balance Cat Food 5lb bags- Buy 12 Bags, Get 1 FREE Bag. Nutro Dog Food 15lb, 24lb, & 30lb bags- Buy 10 Bags, Get 1 FREE Bag. Eagle Pack Dog Food 5lb, 15lb, & 30lb bags- Buy 12 Bags, Get 1 FREE Bag. Eagle Pack Cat Food 5lb & 12lb bags- Buy 12 Bags, Get 1 FREE Bag. Fussie Cat Cat Food 2lb, 4lb & 10lb bags- Buy 12 Bags, Get 1 FREE Bag. Pro Nature Life Dog Food 5lb & 25lb bags- Buy 12 Bags, Get 1 FREE Bag. Pro Nature Life Cat Food 5lb & 11lb bags- Buy 12 Bags, Get 1 FREE Bag. Pro Nature Holistic Dog Food 6lb, 15lb, & 30lb bags- Buy 12 Bags, Get 1 FREE Bag. Pro Nature Holistic Cat Food 6lb & 12lb bags- Buy 12 Bags, Get 1 FREE Bag. Sojos Complete Dry Dog Food 2lb & 8lb bags- Buy 12 Bags, Get 1 FREE Bag. Sojos Pre Mix Dog Food 2lb bags- Buy 12 Bags, Get 1 FREE Bag. Sojos Complete Dry Cat Food 1lb bags- Buy 12 Bags, Get 1 FREE Bag. Canidae Dry Dog Food 4lb - 5lb, 12lb, 23.5lb - 25lb, 44lb bags- Buy 12 Bags, Get 1 FREE Bag. Under the Sun Dry Dog Food 40lb bags- Buy 12 Bags, Get 1 FREE Bag. Taste of the Wild PREY Dry Dog Food 8lb & 25lb bags- Buy 8 Bags, Get 1 FREE Bag. Taste of the Wild PREY Dry Cat Food 6lb & 15lb bags- Buy 8 Bags, Get 1 FREE Bag. Taste of the Wild Dry Dog Food 5lb, 14lb - 15lb, 28lb - 30lb bags- Buy 10 Bags, Get 1 FREE Bag. Taste of the Wild Dry Cat Food 5lb & 15lb bags- Buy 10 Bags, Get 1 FREE Bag. Agway Water Softener Salt 40lb bag- Buy 8 Bags, Get 1 FREE Bag. Feathered Friend Wild Birdseed, all bags- Buy 500lbs of Feathered Friend Wild Birdseed, Get $10.00 Off. Wild Delight Wild Birdseed 5lb bag- Buy 16 bags, Get 1 FREE Bag. Wild Delight Wild Birdseed 7lb - 8lb bags- Buy 24 bags, Get 1 FREE Bag. Wild Delight Wild Birdseed 14lb - 20lb bags- Buy 32 bags, Get 1 FREE Bag. Triple Crown Horse Feed 50lb bags- Buy 12 bags, Get 1 FREE Bag. 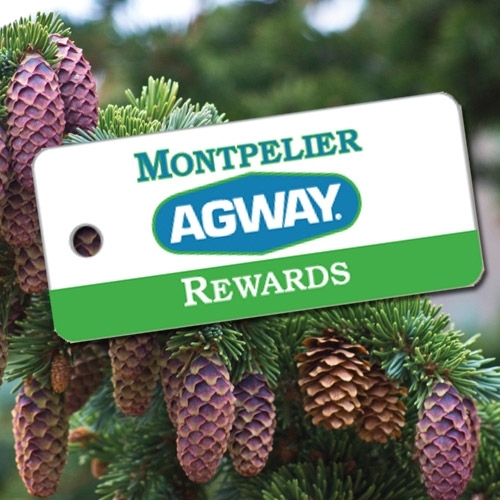 Spend $300.00 in store Purchases, get $10.00 in Rewards.